I like my concept of dumping guys who are not going to get any better, while they still have some value. LA got a second for Vey! Maybe Gads brings us a third? Palmu is worth nothing. Forwards who are physically mature, and not able to compete (according to Cull) for AHL ice time should definitely be cut loose. How much better are they going to become, when physical development is not one of those things that will improve? Keep the baby faces, and develop them. But they aren't though. The criticisms of Jonah is that he needs to get faster and Palmu needs to to work on his board play. Those are things they need to get better at physically. You don't just dump these guys when they're at their lowest value. If that's the only thing that you are looking to get out of prospects, then you should at least build them up first. Personally I'd rather build them so that there is a chance they could play for the Canucks. Both of those guys are 2017 draft picks so I'm not sure what the rush is. They are physically mature though. Both have been men for a couple years now. Wasn't Gadjovic's nick name, dad or something? I think these kinds of guys are dominant at the junior levels because they are men among boys. However, when those boys become men they pass by the early developing guys. That's why I'd like to see these early bloomers get AHL minutes (and lots of them) in roles they would play up here. If they can't make down there now, they aren't going to get much stronger, so why keep them? For those who would like to see the Comets play tonight's game is on TSN 2 @ 4:00 pm PST. Go Comets!!! Millions of people go on twitter and act like they know the ins and outs of whatever's on their minds. That's what people do. Everyone else in this city seems to want to get their opinion in on the situation, so why not a hockey dad who probably follows his son and his team religiously? Especially a dad who almost certainly has more actual knowledge of precisely how the team treats their young prospects than does anyone on this forum. You are dwelling to much on your specific point. There is a lot more to physical battle that yields TOI. The idea that you would cut a high 2 rdr after half a season of AHL hockey is kinda stunning don't you think? I don't disagree that big players in CHL hockey can develop bad habits that hurt them when they turn pro. That doesn't mean they cannot correct their game. I accept my concept is drastic, but I believe if we identify these guy's usefulness to our future early on, we can recoup a better draft pick by trading them sooner rather than later. Baby faced guys, like Lind and Dahlen, need more time to mature for sure. One of Gadjovichs uncles played a couple hundred games in the NHL and one is a director of amateur scouting for the Hurricanes. Sounds like a knowledgeable hockey family. It has been an interesting first half of the season for the Utica Comets. There have been ups and downs for the American Hockey League team while navigating through a myriad of injuries – the team has lost nearly 200 man-games due to various ailments – as well as roster changes (Adam Gaudette was recalled Tuesday after three games) and uneven play. There are positives for Utica, which reached the midpoint of its schedule last weekend in Cleveland. General Manager Ryan Johnson said the team has “done a good job” managing the challenges, including the introduction of numerous rookies. The team has hit a stride since a brief tumble to the bottom of the North Division standings. With help from a recent 13-6-1-0 stretch, Utica has climbed into third place in the North. Is there a key to this recent turnaround? Is resilient the right word? The Comets’ goaltending situation is in flux due to recent moves. Is there a plan to add another goaltender on an NHL deal? Johnson: Obviously, we’re up against it a bit due to the situation on how everything worked out. It is certainly something being worked on. Zack MacEwen has been doing well in his second season. Are you pleased with his production and the strides he’s made? How do you feel about the progress of prospects like Jonah Gadjovich? Trent Cull has said he’s still learning the pace of the game. Kole Lind played with Cam Darcy and Vincent Arseneau last weekend. Did it seem to force him to play a harder game? Johnson: That’s one of the things we’ve been harping on Kole. He’s got a great skill set and he does really good things with the puck. But, how do we get the puck into your hands as much as possible? ... We need (him) to be physical. We need (him) to be first in on the forecheck and turning over pucks. The amount of time Kole had to make plays last weekend was a lot, which we were ecstatic about. But, it was because he was initiating. ... Where he was in September to where he is now, is a great first step in the development process. How do you feel about the progress with Jonathan Dahlen and Lukas Jasek? Johnson: It is the same type of thing. It is the compete, it is playing the total game. Those are guys we want to have the puck as much as possible. ... It is the details of the three zones and making sure they’re taking care of the puck in all areas and being part of the forechecking, competing and giving yourself a chance to have the puck and make plays. As a group all those guys have improved on it and getting better and we hope that continues. Post-Christmas, it seems to settle in and they take a big step. Note: The Comets also added defenseman Cliff Watson on a professional tryout contract Tuesday. Read more at uticaod.com. @UticaHockey What is Utica's PP% this year? Looked stagnant, pretty much just McEneny and Boucher playing catch. The Marlies are whipping that thing around on the PP just like their parent team.. They have been averaging around 20% but it's deceiving. They will go a couple games in a row where they score 2 or 3 PP goals to boost the average back up and then they will be dreadful for the next several games. The most frustrating part to watch is they almost always lose the opening faceoffs on the PP for an immediate clear and then they are terrible at zone entry on the PP. They are so bad a zone entry that they end up trying to dump or chip the puck in which almost always results in a clear. I guess I missed this news. 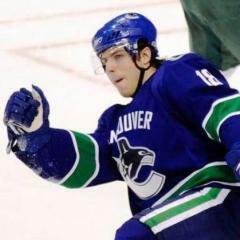 The Canucks have re-upped their contract with the Utica Comets for a minimum of 2 or up to six years. It surprises me that a player such as Gadjovich who came to us with the reputation for being a "hard banger" is apparently slow to pick up the "physical/sandpaper side" of the game. Reading between the lines on Gadjovich Palmu and Lind it seems they have a reluctance to "conform." They are young and so hopefully it will come. I always thought that was Subban's problem too. After watching the Comets/ Marlies game, I came away thinking that a) the Comets looked flat b) Gadjovich and Lind ( who both played with Darcy ) do look a bit behind the top AHLers, but was not too disappointed c) still really like McEneny even tho his +/ - took a beating. It was a good game to show how meaningless that stat can be. d) liked MacEwen. They had him on the Hamilton/ Bancks checking unit and he seemed to take his defensive obligations very seriously. McEneny is the real dark horse in this organization, at least from a fan's viewpoint........most likely because he missed most of last season. However, he might be the next dman to make the transition to the NHL. There's a big difference in dominating teenagers in junior to competing against men in the pro leagues for players who have a skill set like Gadjovich and Lind. They are progressing just fine in their development, despite what fans think is best for them. Gadjovich had a nice hit on the forecheck, but he was fairly average looking at best. MacEwen on the other hand was very noticeable -- not just his size, but he moves around as well as anyone. Gadjovich isn't bad though. He has 3 years to prove himself and his skating has improved from last year. If he can continue to improve, then he will become a possibility for the Canucks. Most players spend 100 games in the AHL before they figure out the pro game and JG will be no exception.